One of my favorite flavor combinations is peanut butter and banana. 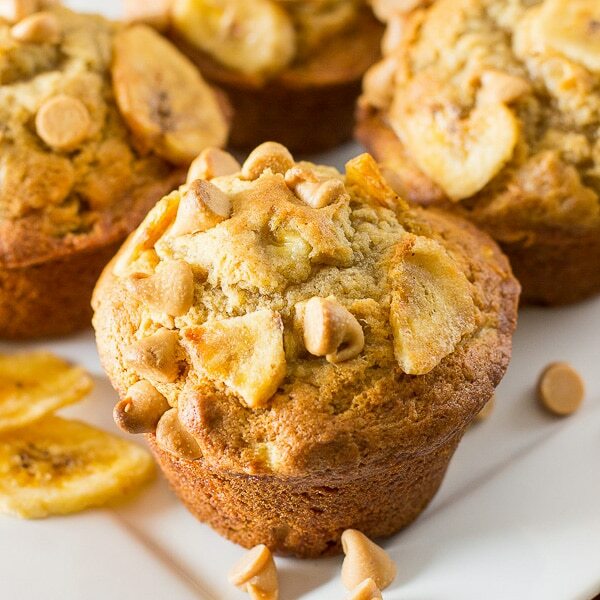 I love it as a snack, and as a topping on my ice cream, but mostly I love the flavor of peanut butter and banana in these amazing Peanut Butter Banana Muffins. 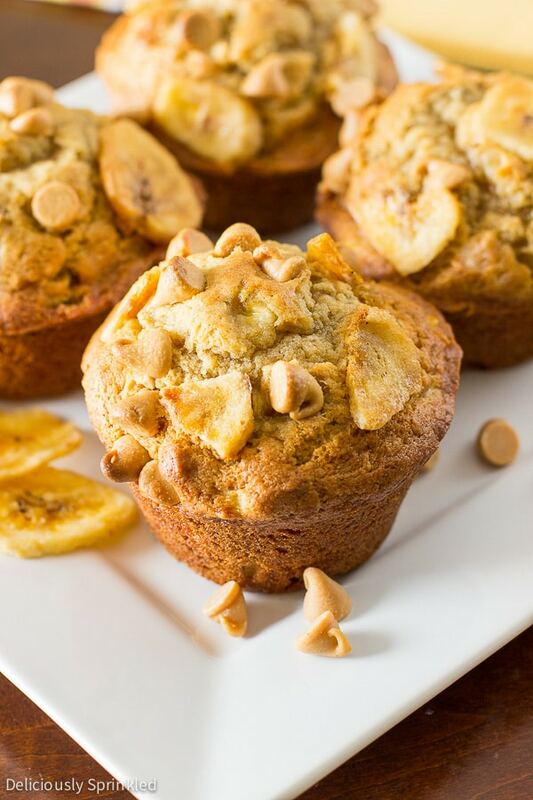 These soft, homemade peanut butter banana muffins are loaded with all the flavors of a delicious banana bread with a hint of peanut butter. There also topped with dried banana chips and Reese’s peanut butter chips, which adds an extra crunchy, peanut buttery topping that takes these muffins to a whole new level. And I think it also makes them look even prettier! ✔ When mixing the butter and sugar together, make sure that you beat it for at least 2 minutes or until it starts to become light in color and creamy. This step is super important, so be patient and make sure it’s light and creamy. ✔ I like to use an ice cream scooper to fill the muffin batter into each muffin tin. I think it makes it super easy and you know that each muffin will be the same size. For these peanut butter banana muffins, I pressed dried banana chips and Reese’s peanut butter chips into the top of the muffin batter, but if you don’t want to use banana chips and Reese’s peanut butter chips, no worries the muffins will still be just as good! ✔ Lastly, don’t let the muffins “cool” in the hot muffin pan, after about 5 minutes take the muffins out of the muffin pan and place them on a wire rack to cool for another 5-10 minutes. Keeping the muffins in the muffin pan too long will lead to dry, overcooked muffins. Preheat oven to 425F degrees. Spray 12 muffin cups with non-stick cooking spray. Set aside. Add mashed bananas and creamy peanut butter, mix until combined. Using an ice cream scooper, scoop muffin batter into prepared muffin tins. Press dried banana chips and peanut butter chips into each muffin. Bake at 425F for 5 minutes. Keeping the muffins in the oven, reduce the oven temperature to 350F and continue to bake for 12-15 more minutes or until a toothpick inserted in the center comes out clean. * Store muffins in a covered container at room temperature for 3 days. Muffins can be frozen up to 3 months. 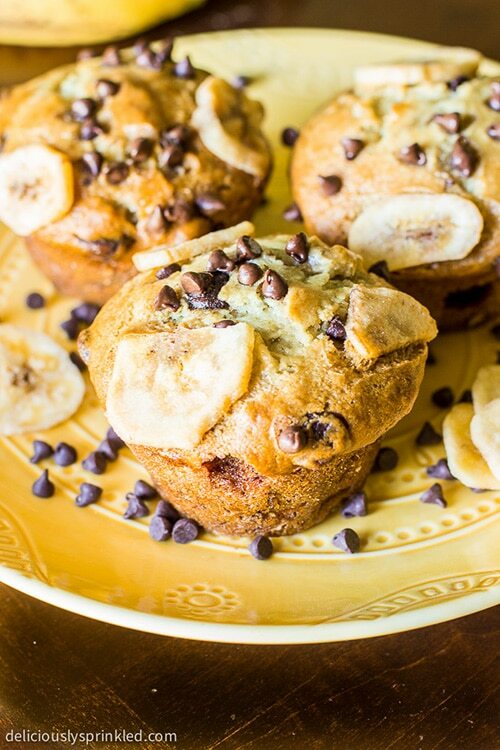 And try these Chocolate Chip Banana Muffins next! Love the step by step pictures and the tips! 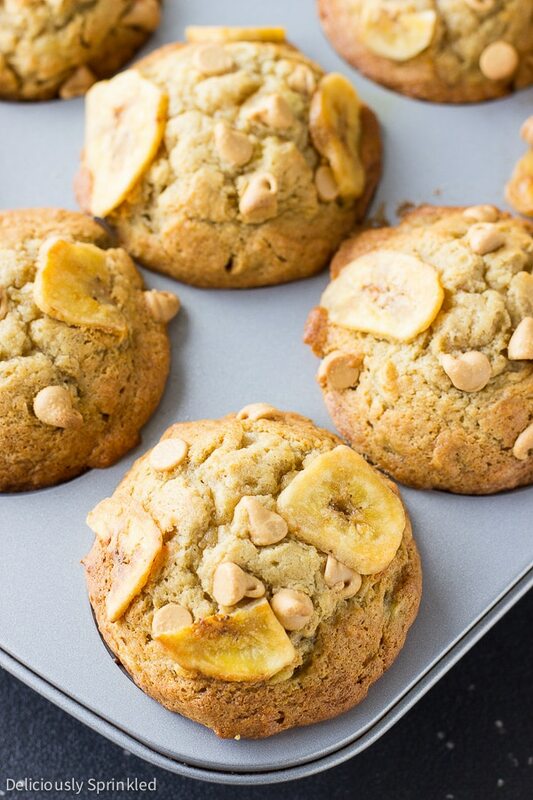 These peanut butter banana muffins look amazing! Pinned! I showed my boyfriend these when you posted the teaser on Facebook and he was like, “WHERE ARE THEY? !” haha! He thought that I made them and was showing him the pictures I took. Sooo, I think it’s safe to say I’ll be making these for him in the very near future! 🙂 Love the addition of banana chips! Peanut butter and banana is such a classic flavour combination.. just like peanut butter and chocolate is. I can imagine these muffins tasted so delicious! Wow, these muffins are so pretty! And they sound delicious too! I love these muffins! Peanut butter and banana is definitely my favorite flavor combination! 🙂 And these muffins are gorgeous! !